In April 1992 a young man from a well-to-do family hitchhiked to Alaska and walked alone into the wilderness north of Mt. McKinley. His name was Christopher Johnson McCandless. He had given $25,000 in savings to charity, abandoned his car and most of his possessions, burned all the cash in his wallet, and invented a new life for himself. Four months later, his decomposed body was found by a moose hunter. How McCandless came to die is the unforgettable story of "Into the Wild. When McCandless's innocent mistakes turn out to be irreversibleand fatal, he becomes the stuff of tabloid headlines and is dismissed for his naivete, pretensions, and hubris. He is said to have had a death wish but wanting to die is a very different thing from being compelled to look over the edge. 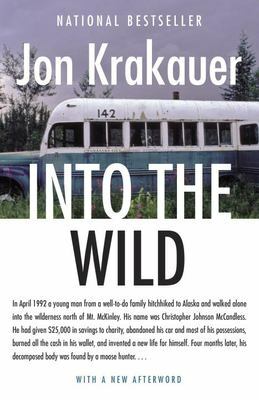 Krakauer brings McCandless's uncompromising pilgrimage out of the shadows, and the peril, adversity, and renunciation sought by this enigmatic young man are illuminated with a rare understanding--and not an ounce of sentimentality. Mesmerizing, heartbreaking, "Into the Wild is a "tour de force. The power and luminosity of Jon Krakauer's stoytelling blaze through every page. Used Good (19 available) Shows some signs of wear, and may have some markings on the inside. 100% Money Back Guarantee. Shipped to over one million happy customers. Your purchase benefits world literacy! Used Very Good (30 available) Great condition for a used book! Minimal wear. 100% Money Back Guarantee. Shipped to over one million happy customers. Your purchase benefits world literacy!